Please Log In to use WRAP Volunteer resources. If you don't have a password, or if you've forgotten it, on the Log In screen enter your email address and click on the Lost Your Password link. You will receive a link to create a new password via email. A strong password will be suggested which you can backspace out and replace with a password of your choice, but please use at least eight characters including capitalized letters, numbers, and symbols. Donations are accepted with gratitude. As a Not-for-Profit organization all donations are fully tax deductible. Expenses frequently exceed the amount we ask for adopting a Whippet, and we welcome any contribution you can make. Donate by check or PayPal. If you use Amazon for purchases, please consider signing up for Amazon Smile and choosing WRAP as your charity! Amazon will make a small donation to WRAP with each purchase you make on Amazon Smile. 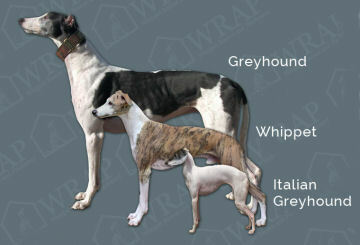 Is a Whippet a miniature Greyhound? Get answers to this and many more questions! Copyright © 2019 Whippet Rescue and Placement. All rights reserved.